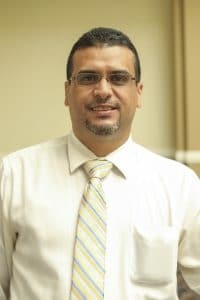 ElGaddafi El-Amami (Gadd) is currently an assistant professor of mathematics at Southern Arkansas University. Dr. El-Amami received his Ph.D. and M.S. degrees in mathematics and applied mathematics from the North Carolina State University at Raleigh in 2013 and 2011 respectively. He also received the M.S and B.S. degrees in pure mathematics and mathematics from the University of Benghazi, Libya in 2006 and 2000 respectively. His current research interests area is the part of Algebraic Topology that is included within topological fixed point theory. My research is in the field of Nielson fixed point theory and coincidence theory. In addition, Numerical Analysis is my applied mathematics area of interest, Solving Elliptic Partial differential equations numerically using the Immersed Interface Method IIM, the fast augmented IIM techniques in solving 3D elliptic interface problems and its applications, and computer programming.